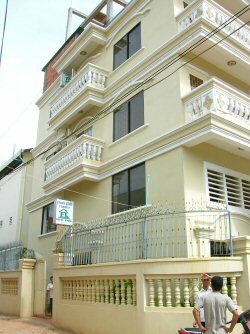 It's a modern and nice guesthouse managed by Scandinavians and Khmers. It has 23 guestrooms in a 4-storey building, every room has private bathroom and there is also A/C, cable-TV and hot water. Conveniently located in the center of Siem Reap town, close to the Old Market, Sivatha Road area and the rest of the facilitates in centre city. But it is far enough away from the noise. » have English-speaking, friendly, attentive staff. different Cambodian and international meals. arrange pickup from Poi-Pet (Thailand border, 140 km) or other locations. » arrange tours to Angkor Wat or other temple of Angkor (8-12 km) or other tours of customer's choice. » don't accept credit card, cash only.